Let's face it, that sissy little alternator stuck in at the factory just doesn't cut the mustard when you throw a winch, lights, or modern stereo on your vehicle. Its time to give your ride a charge! Pictured to the left is our 100amp alternator and mounting kit all set up on the 1.6 engine. 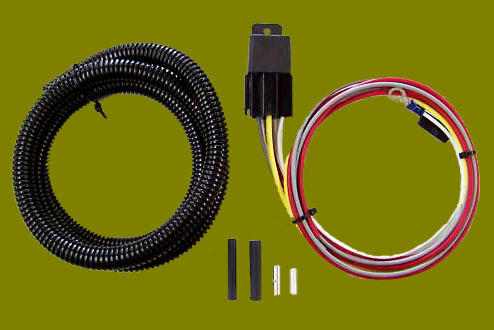 We introduce super simple installation hardware kit for a Delco alternator for any 4cyl Suzuki/Geo engine. 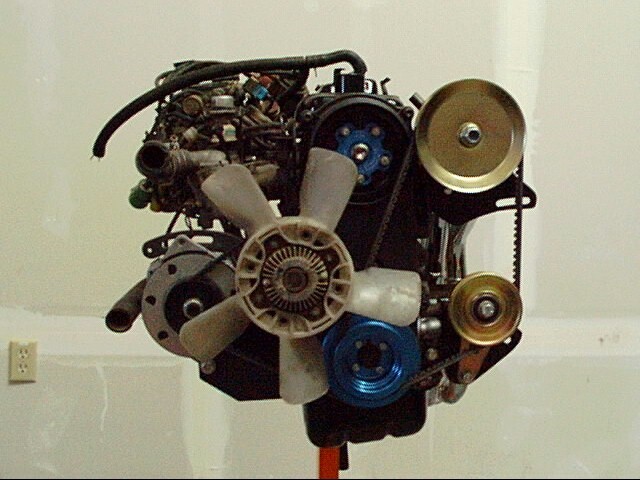 The alternator is a Delco 12-si that you supply and is available at pretty much any auto parts store, alt. repair shops, and most junkyards. It is found on General Motors cars built from 1973 until 1985. As a rule of thumb, the more factory electrical accessories on the vehicle it came from, the higher the amperage. Most you will find from a salvage yard are going to be in the 80-90amp range... roughly double that of the stock alternator on your vehicle. Our basic mounting system provides the mounting bracket, the slider bracket, and instructions, you supply the rest and save $$$. Please pay close attention to our instructions as incorrect wiring can fry the regulator. Please email our tech staff if you have questions on this during installation. We do also carry new 100amp alternators. Make sure and save your stock pulley as it may be needed for the new alternator. The new kits come with a serpentine style pulley which often does line up, but not every time for some reason (which is why we recommend to keep your original pulley). Our alternator kits exceed OE specifications for input voltage and amperage. All new voltage regulator, rotors, rectifier bridges, diodes, stators, fans, pulleys, solenoids, commutator, drive gear, armature, field coil, and brush assemblies. If you are looking for an alternator upgrade, Rocky Road has the fix for you and we even carry a full system with the mounting, new alt, and belt all ready to go. PLEASE NOTE: Pay close attention to the installation instructions if you purchase the alternator. Failure to do so could result in damaging the internals of the alternator, incorrect operation, and warranty void! Sick of the clickity, click, click??? This great little kit does more than stop that frustrating clicky starter it also gives your starter the power it's been starving for!!! If you get in and turn the Key to start your vehicle, and you find it has the dreaded Click Syndrome, then this is the fix it needs. Don't delay in getting this High quality and easy to install kit.... because waiting can, and likely will cause damage to your Starter. Installs easily in about 5 to 10 min. Detailed, Easy to Follow Instructions, with Excellent pictures to assist those who are Mechanically / Technically challenged. All wire is 14 gauge Automotive cross-linked wire , (OEM is 18ga.). Everything you need to install this is included, Except the Screwdriver. This kit uses a very High Quality 30amp relay and also includes a waterproof heavy duty 30 amp fuse to protect the battery to starter connection. Also a great kit to help prevent solenoid detrioration as it delivers more direct power to the starter. Designed originally for the Samurai, but it still works well on the Sidekick and Tracker.